Im not going to claim the last word on this, the topic is so much bigger than me. I welcome comments that inform me or even influence me to adjust my opinion. I live in choppy waters…I am a devout Christian who really believes in miracles and I have worked in very high-tech healthcare settings. I often hear others refer to miracles in ways that I find ill-advised …bear with me while I try to find words to 30 years of observations on this tough but important subject. I have had people accuse me (to my face) of not believing in miracles of physical healing simply because I was wearing a white lab coat – there was an assumption that I couldn’t reconcile Healthcare and Faith. I have no idea what I would have to look like for them to assume I did believe. I want to keep this topic narrow, but please know that I believe that the world itself would have never existed outside the realm of God and in that you could see miracles are everywhere, but I want to narrow the scope here to miraculous physical healings. In using “miracle” here, I’m NOT referring to an outcome that was unlikely but possible or beating the odds…I’m referring to supernatural healing of the physical flesh; recovery that was not physically possible under the circumstances given the laws of science and nature. Without God actually suspending the laws of nature, death would be certain and likely soon. They do happen and they are demonstrable. There is also another type of “miracle” (or perhaps “Grace”) that I see much more often than “physical healing”…I will refer to it later but I want you to know that I am a huge believer in it. This grace is observable when a person in a terrible situation endures heartbreaking circumstances survives the emotionally un-survivable and comes out better than they were before. Whether is is a triumph over the impossible (an actual miracle), amazing process of growth or just a nice outcome is not really known to anyone but the person themselves. I am witness to this all the time, I do see God’s grace at work and it never gets old. Back to the physical healing miracles…. Have I seen miraculous healings? Yes. If my memory serves, in caring for thousands of sick people, I think I have seen 2 or 3 events that could only have been miracles. Have I seen wonderful things happen that might have been miracles but it was hard to really discern the miraculousness of it ? Yes, many. Have I seen really good and faithful people beg for a miracle and not get one? Yes, many times. Does the absence of a miracle cause me to doubt my faith? No, I don’t see miracles of physical healing as the norm of life. I think were called to faith even if we never saw a miracle. We’re welcome to ask for a miracle, appreciate one if it happens, but we can’t demand one or make a medical plan counting on one. There are people who say that if God allowed more miracles, more people would believe. They see a rarity of miracles as proof that God doesn’t exist. The Gospels are replete with very observable miracles – Lazarus coming back to life, feeding of the 5000, the Transfiguration…and yet even people who had a front row seat to those miracles had huge lapses in faith and ran away when things got difficult. Of the 5000 people fed with the loaves and fishes, how many were at the foot of the cross saying “well heck, I thought he was a good guy, he fed us with nothing, didn’t he?” Only John stood there with the women, so it failed with 4999 of them. I once had a dog who was on death’s door (horrible pain that left him screaming in a way I didn’t even know dogs could scream, he was paralyzed, had an active acute GI bleed & pooped out about half his blood volume) his euthanasia was scheduled based on how many pain pills I had left. I refused to ask for a miracle because I cared for dying human babies all day and I felt it was petty and selfish for me to ask God to heal my dog. I felt an interior nudge to go ahead and ask and it sounded something like “Dear God, if this isn’t too selfish or insulting to the magnitude of suffering that I see on a regular basis, please heal my dog. Amen” I gave him an Aleve pill and he vomited violently & repeatedly after which he oddly looked better. His pain subsided and his bleeding stopped and over the next few days he started walking again. I figured he would never go up/down stairs or around the block again, but he did. Was it a natural recovery that would have happened without the prayer or was it a miracle? I feel presumptuous to claim it a miracle but at the time it sure felt like one. I was a little embarrassed because I didn’t feel like I deserved it (do we EVER deserve them?) He returned to being a wonderful companion and was a needed buddy for me when I went through a terrible time soon afterwords. He died a few years later in the melamine tainted dog food poisoning scandal of 2007. I had the most interesting experience, I was involved in something that was later written about in a book. The author of the book was not in the room at the time and it was so strange for me to read something from my life described by someone who was not there. Im not going to give any of it away, you will have to buy Fr Stefan’s book yourself . I have come away from near-miss car accidents without a scratch & had family disasters averted by such a narrow margin that I felt I could see angel wings fluttering in my midst. The miraculous rescues & recoveries we live and hear of are intermingled in a world where horrible accidents and diseases claim the lives of good people everyday . I think its east to get an inflated sense of self when one gets a miracle, but I have come to believe that maybe one persons survival has much more to do with what service they may give to someone else in the future. Maybe I survived a near miss car wreck because God deeply loved someone else who would later need me, it could have been for them all along that I survived. God is sovereign yet His miracles really are unpredictable and random to our limited human eyes. When can hoping for miracles backfire on us? I often say if I could remove 2 phrases from the english language they would be “just a miscarriage” and “miracle baby”. “Just a miscarriage” is dealt with in another post, lets stick with “miracle baby”. Are there ACTUAL “miracle babies” out there? I’m sure there are, but the media uses that phrase with no reference to the Divine in any way to describe babies who survive difficult courses in the NICU after being born very small or sick. That has a few really bad side effects that end up hurting people. 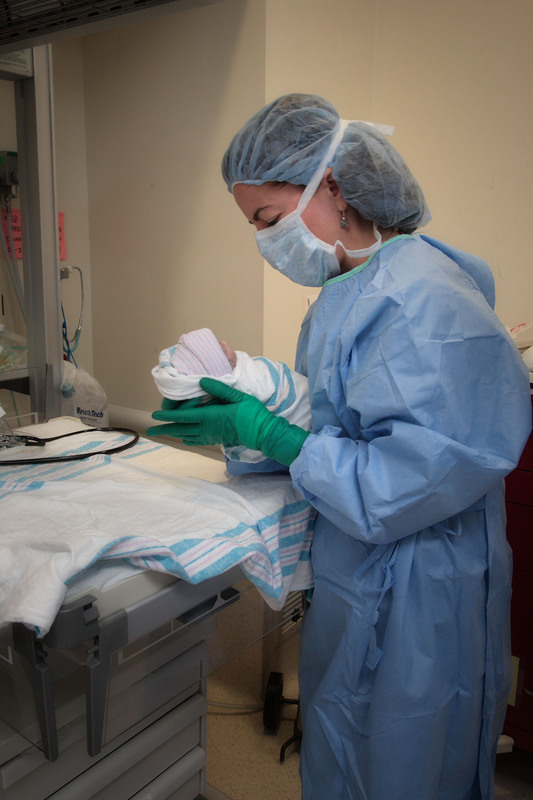 The media mentions of NICU/Neonatology virtually never include any reference to neonatal death at all. This leaves “Joe Average” who may see a story on the news mistakenly thinking that all babies born alive can survive if they go to the NICU. I have MANY times had to reinforce the Neonatologists explanation to a family of why their 20 or 21 weeker will NOT be going to the NICU and had them stare back at me in full bewilderment. In the natural world, 20 & 21 weekers don’t survive. They are precious and dear and beautiful, but following the normal laws of nature, they don’t survive. Giving people the impression that something is medically possible that isn’t really is not a kindness. There are outliers in the media with claims of 1 or 2 extreme survivors…I am not sure that I believe that these cases are real, but if they are then they ARE miracles and cannot be used as exemplars of medical care. Whenever this comes up, well-intentioned people often come out of the woodwork accusing people of refusing to resuscitate 21 weekers because we don’t care and want to save money. Neither of those things could be further from the truth. I will stop and hope I avoid particular attack in comments. There was a baby in Australia who was declared dead and given to the mother to hold. The world will likely never know if the baby either wasn’t really dead in the first place or if there was a miracle. Either way though, the way the media reported it, it must have a disaster of Biblical proportions for tens of thousands of bereaved parents worldwide.http://moms.today.msnbc.msn.com/_news/2012/03/08/10562260-pronounced-dead-revived-by-moms-hug-miracle-baby-turning-2?lite Remember that the media is not going to give God the credit if the baby were actually resurrected, they had to turn it back into a natural phenomenon so they said that the mom hugged the baby just right to bring it back to life. That sounds harmless unless you look at it from the point of view of a mom who also held her deceased/dying baby who DIDN’T comeback to life and recover. Knowing as many bereaved moms as I do, I can’t begin to imagine the knife-in-gut twisting effect that an article like this would have on them. I’m sincerely happy for the family who enjoyed the survival of the baby , but the media was grossly irresponsible with not understanding the effect it would have on the bereaved. When I first saw that coverage, I had a knee-jerk reaction “if that is how people react to miracles, if I were God I wouldn’t do so many” … lets all be glad that God is infinitely smarter and more patient than me. I have seen other news stories of apparent deaths that reversed themselves and the secular media seems to take great pleasure in (again) not only ignoring the Divine but in bashing the Medical team for apparently “goofing up” so badly. What a horrible insult to the decent people we trust to take care of us…I think of a Doctor standing vigil with a family and giving his/her all and when the outcome is miraculous, people will say the Physician was stupid and misguided. What a lack of charity and decency to the very people we ask to care for us in times of crisis. 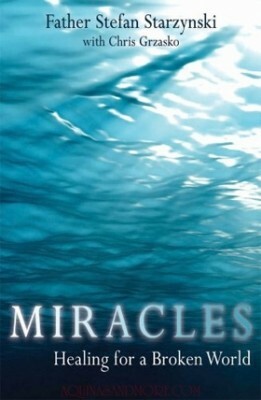 What if a person knew they were in a terrible situation and allowed the entirely of their faith to depend on a miracle? Again, I don’t see physical healing miracles as a norm of life…I’m thrilled when they happen, but I think the normal course of life is to rise to the challenges we have in front of us, not hope that our challenges suddenly disappear. How God decides which requests for miracles to honor and to which to answer with a “no, but trust Me” – none of us will ever know. I see a huge danger in hanging every last hope on a miracle, I worry for those left behind. 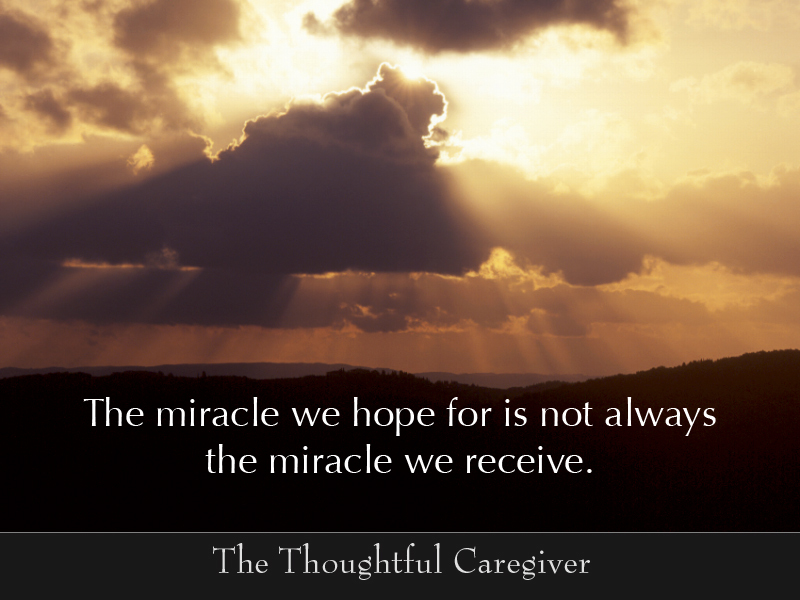 My last concern for a ‘hope of miracles’ backfiring is that I have too many times seen “waiting for a miracle” be the reason given for forcing a person to submit to the severe burdens of aggressive and fruitless medical care long after it has become clear that all (natural) hope has ended. Getting to a place where the family can agree to back away from ineffective and burdensome treatment is a process and we should never jump ahead too fast, but none of our loved ones (of any age) should have to suffer needlessly while we “wait for a miracle” (and I’m NOT talking about euthanasia active or passive, I’m talking about prudent & ethical care reaching the end of what science has to offer). If we agree that an actual miracle itself breaks the laws of nature, then God does NOT need a ventilator or ECMO or a Dopamine drip. The 3 cases I have ever heard of in my life (one on tv, one who is a friend of distant friend, and one was a baby I cared for) of spontaneous resurrection were fully WITHOUT intervention. It stands to reason that any of us would want the miracle of our loved ones regaining health even after the chance of it happening is really outside the realm of possibility. I’m right there with you. I’ve learned that God wants us to be willing to ask for a miracle. When we get one, I think we should be humble and thankful at the same time never responding in a “maybe if you hugged your baby right, he would have lived too” mode. For most of us in most situations, the more common task becomes handling circumstances when the miracle doesn’t happen. Revisiting my earlier idea…I have seen people survive and grow and learn and eventually thrive and help others in ways that they would have never imagined when first faced with their hardship. Yes they asked for a physical healing for their baby and the answer apparently was “No, but trust Me”. Miracles give us a certain kind of hope but not the only kind of hope. To me miracles are the candy of life but learning and growing through and in our trials are the meat of life. Happened upon this while trying to look for something on relapsed health after an initial healing. Jen, it once struck me that even the people healed by the hands of Jesus in the Bible eventually grew old, got other diseases and eventually died of something. Miraculous healings are wonderful but they don’t change the fact that our lives are all finite and we will suffer from something. I have known people miraculously healed from MS who later developed cancer…did it mean that God didn’t love him? I don’t think so…it meant that all temporal things are finite. I wish you physical, spiritual and emotional healing and wholeness and consolation from God if you dont get all 3.